I've been pretty super busy lately running around after work trying to source fabric and draft patterns. 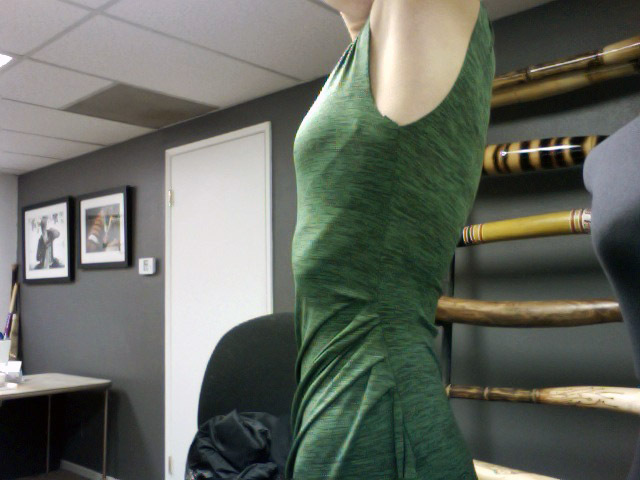 A couple weekends ago I found this fabulous green stretch knit. I think I might be in love with it because it's the Pantone color of the year: emerald, or it might be love because of the fabulous way it drapes. When I bought it I had a dress in mind. Of course I only had odd cuts of muslin to make this pattern with so it's kind of messed up but I figured that I would give you all a sneak peak into one of my projects... even though it may fail. As you can especially see in the last image, the side seam is spinning towards the back. I also have yet to put on sleeve and finish the neck and hemline. Some of the draping that I created on the muslin didn't transfer well to this soft handed fabric. I also draped the muslin in a much stiffer way than you normally would since I only had a strange cut left. Oh, and yes, this is totally a PhotoBooth photo post. It's kind of a toss up of a project, but I really hope it works out because I'm already in love with it! Plus, I have the perfect boots for it... but more on that later!